What can I do about a toilet flange that is 1/4" below the finished floor? So to my question. Is this the correct approach? Should the flange be level with the floor prior to installation? Edit: The correct height of the flange is sitting on top of the finished floor. Of course with a remodel this is almost never going to be the case after tiling. There seem to be various methods to raise the flange. Many say the double wax ring is problematic since it can collapse into the drain over time. This link discusses a number of products to solve the problem. In summary, the set-rite (~18 + shipping) is the most expensive and apparently the only code approved product. The cheapest option is flange extenders ~$3-5. The funny thing is neither the tiler or the plumber that worked on my bathroom mentioned anything about the height problem, which leads me to believe the common solution is the double wax ring. The flange should sit on top of the finished floor, if it doesn't you'll have to modify the plumbing or find another way to achieve this. 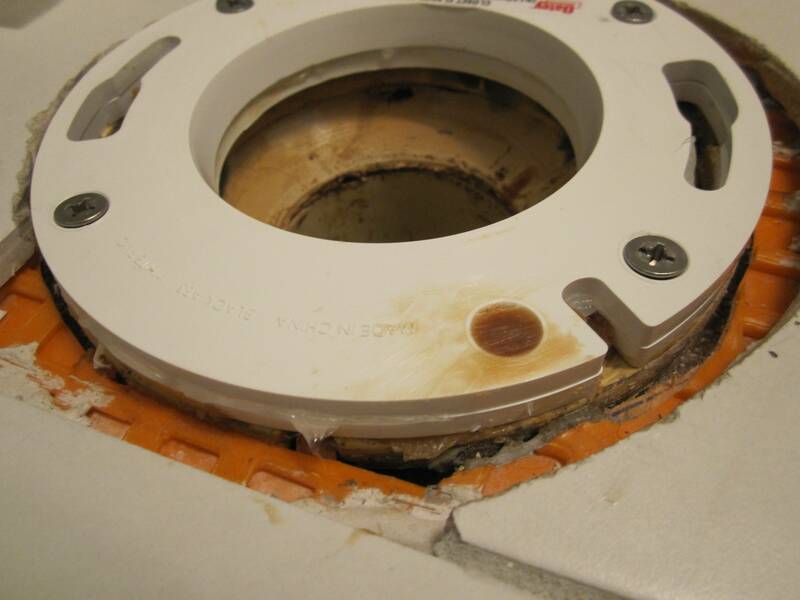 Notice in this image how the toilet waste pipe sits just inside the flange opening, this is the proper way for a toilet to sit on a flange. Even without a wax ring, this union is not likely to leak under normal circumstances (I'm not recommending a wax ring not be used). Wax as a waste pipe? Some folks recommend using a thicker wax ring, or even doubling up wax rings. The problem with this, is that you end up with a waste pipe made from wax. Now this might hold up, but more than likely it's eventually going to fail, and leak. If you have access to the flange from below, you might be able to modify the plumbing to make the flange sit atop the floor. In most cases, however, this is not an option. There are adapters available, that solve this exact problem. 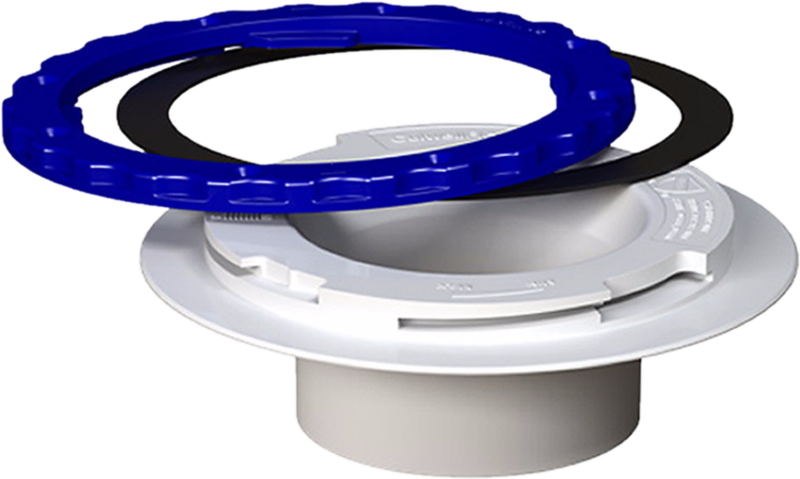 The Set-Rite Toilet Flange Extender Kit; described in the answers to this question, Comes with different size spacers, which allows it to compensate for various sized offsets. I was 1/2" below where it should have been so I used two flange extenders to get the flange 1/4" above the finished floor. They are siliconed together and wax is the seal between the original flange and extender. Although many seem to recommend silicone, it would have been too much work to get off all the old wax so I used a few gobs of new wax. I talked to an employee at Lowe's and he recommended Culwell Flange. +1 for using Ditra under tile. You can use either plastic or the metal ring (I prefer the metal for a bit more holding power with the 'T' bolts). It doesn't look like the toilet fully seated in the wax. Is the floor flat front to back? Be sure to PUSH the toilet down, with a slight (very slight) twist. If you use two rings it will eventually leak. You need one thick wax ring. This one or Oatey's version can cover a 1/4 inch. Check out this product from Korky. I find that it's a lot easier to use than wax. Also it won't absorb the dirty toilet water like the Saniseal will. 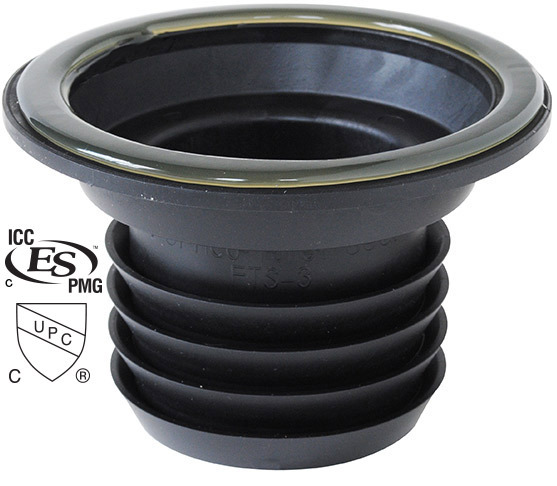 You do have to buy the right size to get a good seal with the pipe below. Also, you have to make sure to thoroughly clean the surface where the adhesive attaches to the bottom of the toilet so all the wax residue is gone - I used brake cleaner to make sure, because I didn't really want to do this job once, I definitely didn't want to do it twice. Ideally, you want the flange on top of your finished flooring. However, I encountered the same issue last year and was able to solve it without modifying the flooring, after consulting a plumber. As long as the flange is in good condition, a well sculpted layer of hard plumber's putty can be used to fill in the gap between the flange and the finished flooring. A flexible, waxless gasket like a saniseal is best used with this setup instead of the classic wax ring. Working perfectly for me a year on. I've been using wax for years, but recently very unhappy with the products we buy in wax style rings. By the time you get the wax ring out of the packaging you may as well be the wax ring yourself, your hands pants and body are covered with wax. We've been using a new product called Sani Seal. Really sweet and very reliable. See their web site and videos. Sure each ring is $12, but the toilet seal is worth every penny/dollar. Not the answer you're looking for? Browse other questions tagged plumbing tile toilet or ask your own question. 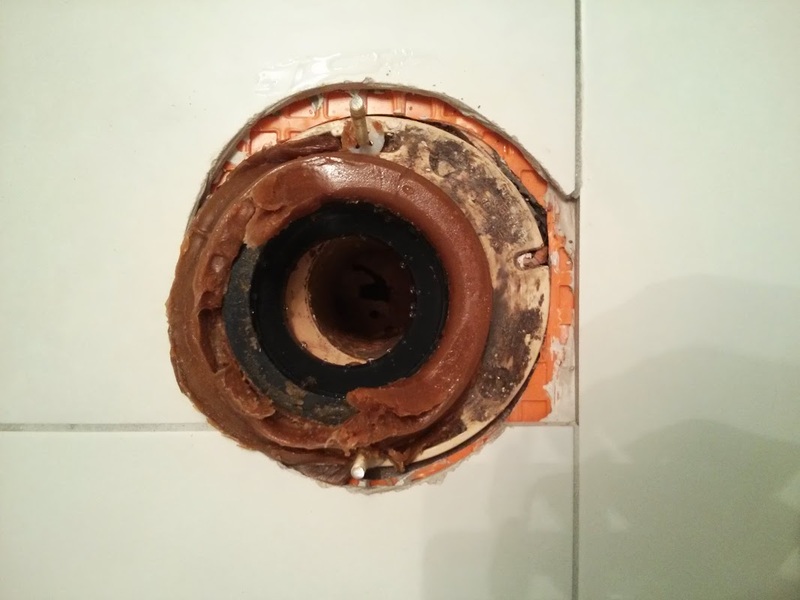 Is it a problem that my toilet flange is 3/8" below the surrounding tile? What do I do about a toilet flange that is too high? How should I repair a pvc flange set into concrete slab?